Does your boat suffer from CD? A multitude of aging sailboats do, and it can be ruinous. If you are a sailboat owner, you need to know how to prevent CD and perhaps how to treat it. What the heck is CD? I just made it up (influenced no doubt by incessant pharmaceutical ads). It stands for core dysfunction. It means something is going on that has compromised the stiffness and strength of a laminate reinforced with a core material. However, before addressing CD, let’s get up to speed on core construction. The use of cored laminate has undeniable appeal for sailboat construction. Compared to solid fiberglass, core construction is lighter and/or stronger. That translates into a boat that is more easily driven, making it quicker or, with smaller sails, easier to handle. The stiffness of cored laminate reduces the need for additional support components, delivering more interior space with fewer layout limitations. Most core materials also provide significant insulation, which in turn, makes cabin temperatures more comfortable: cooler when the outside temperature is hot, and warmer when it is cold. These same insulating properties also reduce or eliminate interior condensation and dampen sound transmission, making the boat quieter. Add to that lower cost, particularly where stiffness is the primary objective, and it is no wonder that virtually all fiberglass sailboats incorporate core in some part of their construction. If your sailboat has a cabin, you can be 99 percent sure that the deck is cored. 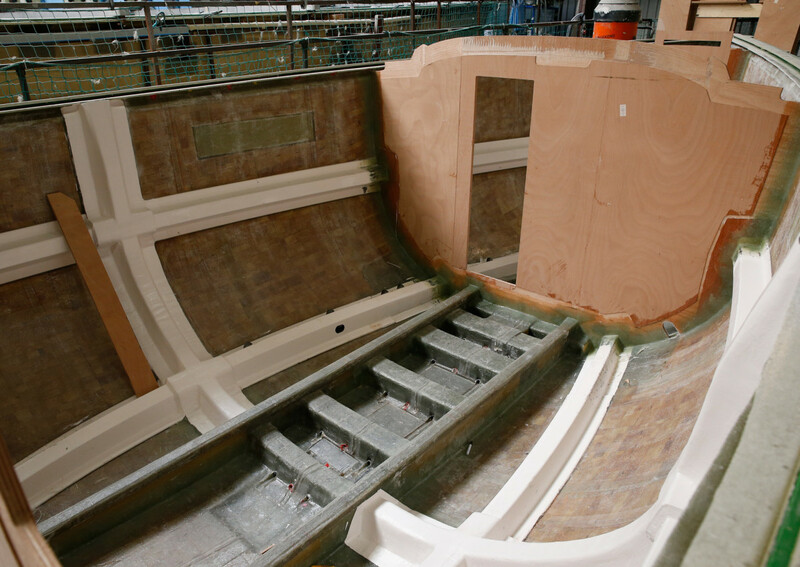 Many production sailboats also incorporate a core in the hull construction in pursuit of better performance. It is important to understand that core rigidity is not what determines the stiffness of the laminate. Balsa core, for example, is often made of small blocks of balsa adhered to a scrim, similar to mosaic bathroom tile. So how do two flexible skins and a core as floppy as a doormat create a stiff deck? The same way three thin metal panels create a bend-resisting I-beam. The parallel flanges of an I-beam are joined by the perpendicular component called the web. Without getting too deep into the weeds, bending stress imposes compression loads on one flange and tension loads on the other, creating a shear load on the web, which the steel resists mightily. The result is a combined stiffness much greater than the individual stiffness of components. Unfortunately, cored laminate compares to an I-beam in principle only. While the I-beam is typically formed from a single steel blank, the “web” component of a cored laminate is usually wood or plastic foam sandwiched between fiberglass skins. This lack of homogeneity makes the assembly fragile, even more so than solid fiberglass, where laminates are bonded together on a molecular level. In a composite laminate, the core is attached to the skins via an adhesive bond, not chemically. That bond is the weak link. If it fails, the three detached components become more leaf spring than I-beam. Wood is by far the most common core material used in boat construction. Nearly all production sailboats manufactured in the last 50 years incorporate a wood core in the deck structure—sometimes plywood, but mostly balsa, thanks to the fact it is light, stiff and inexpensive. In addition, with its grain sealed against the skins, balsa does not readily transmit moisture, limiting the potential damage of water penetration, and exhibits excellent shear strength, perhaps the best of all common core materials. It also resists becoming detached from the skins better than other cores, which is good for maintaining I-beam like stiffness and prevents the migration of water across the core. If moisture does penetrate, balsa maintains much of its integrity wet and can often be fully restored by drying. It also resists rot, so the window of opportunity for saving the core after a leak occurs is much wider than with other woods. Lastly, balsa has good insulating properties. Plywood is also found sandwiched in sailboat decks, but it is a poorer choice. Its appeals are low cost and strength, but plywood is heavy, and the multiple bonds between layers exacerbate the disadvantages of a glued-together composite. Worse still, the laminar construction of plywood makes it extremely susceptible to water migration, and the woods used are prone to rot when wet. The real-world near inevitability of water penetration argues that there is little to recommend plywood core beyond low initial cost. That said, employed just at hardware mounting locations, plywood does offer greater resistance than balsa to the compression of fasteners or rigging loads, so used this way, it can serve well, if kept dry. Beyond that, plastic foam core materials are more common in hulls than decks. Foam core comes in three flavors: styrene acrylonitrile (SAN), linear polyvinyl chloride (PVC) and cross-linked polyvinyl chloride. These have varying engineering properties, but from the owner’s viewpoint all are essentially the same. 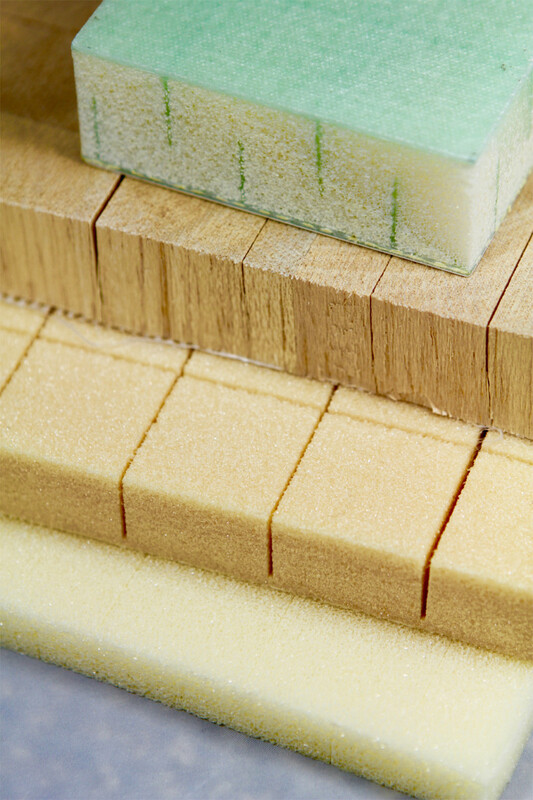 The primary advantages of plastic foam is that it is lighter than balsa, its closed-cell construction resists water migration or saturation, and it does not rot. 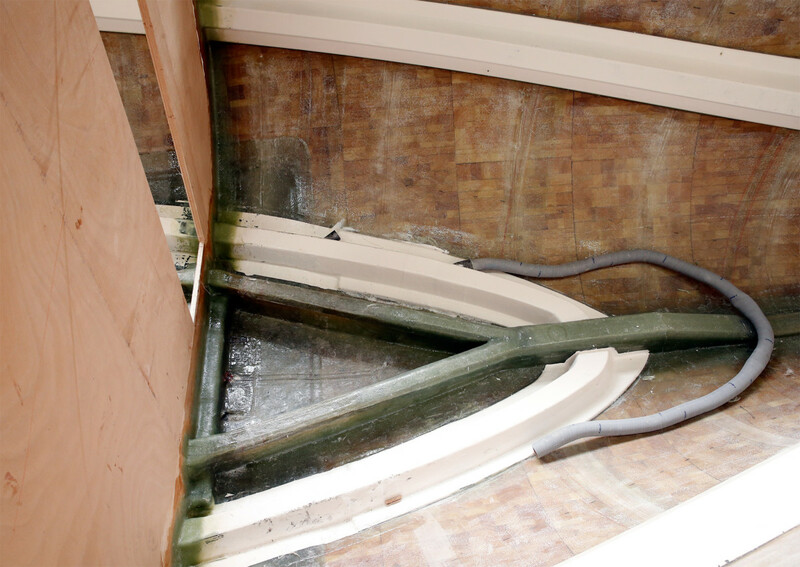 This resistance to water damage has made plastic foam the dominant choice for cored hulls. A third core possibility is a honeycomb structure between skins. This creates the lightest composite possible, because most of the space between the skins is just air. A honeycomb composite can also be impressively stiff, although because the bond is limited to the edges of the honeycomb it is also relatively fragile. Honeycomb core has long been used in one-off race boat construction where winning trumps durability. However, in recent years plastic honeycomb has also been finding some employment in production boat hulls and decks. The long-term outcome of this practice has yet to be determined. However, there is little doubt of the benefit of using a honeycomb core for interior bulkhead construction, where it can reduce the weight by more than half compared to plywood. Which brings us to core dysfunction, or CD. Being invisible to the boat owner, the substantial benefits of cored construction are simply a feature of the boat—until something goes wrong or it stops working, at which point it can quickly overshadow all else. The primary causes of core failure, or CD, are impact, water intrusion and manufacturing defect. Impact needs the least explanation. When a composite laminate experiences an impact, the impacted skin takes a concave shape while the opposite skin is forced into a convex shape. That puts heavy shear stresses on the core, most acute at the core’s outer surfaces, hence at the bonds between core and skin. The result is likely to be delamination. With the core separated from the skins, the stiffening function of the core is largely lost. The violent flex of an impact can sunder the bond over a large area, but even a small area of delamination can be destructive. That area will flex under pressure, tearing at the edges of the bond and over time increasing the area of damage. Delamination can be hard to discern until large enough for the skin and core to spring apart. Water intrusion is the real destroyer. The bond between skin and core can be restored, but not if the core is wet. Saturated plywood quickly delaminates, losing all function. Similarly, despite claims to the contrary, balsa also rots. True, it resists for a while, but in the constant presence of moisture, decay is inevitable. Whatever the core material, trapped water also exerts a hydraulic pressure that will further damage the core and bond. If a boat experiences freezing temperatures, the expansion of the water becoming ice also does damage. How does the water get in? The tiniest skin breach from impact will jet in moisture, with the crushing force of the impact typically having left an inviting void between skin and core. Even undamaged fiberglass is not 100 percent impermeable, so where core is employed for a submerged portion of the boat, moisture might simply migrate through the exterior skin. For that very reason, production boats typically core hulls only above the waterline. By far, the most common source of destructive moisture in cored laminate is via holes drilled intentionally through the otherwise protective skins. This can be essential hardware, or a teak deck (hundreds of holes! ), factory installed or an item mounted by yard or owner. In a perfect world, even with an opening in the skin, water would have no place to go given that the space is filled entirely with a closed-cell core. However, the reality is that core is typically laid into a female mold during construction, making the completeness of the bond invisible on the underside of the core. Add to that a core material configured in blocks or with deep kerfs to allow it to contour to the shape of the component it reinforces, and there are likely to be ample channels and reservoirs for moisture to migrate and accumulate. CD can also occur due to manufacturing defects. A common example is cored construction of inadequate thickness to resist flexing, which soon delaminates. Some plastic foams are unsuitable for specific core applications due to mechanical or thermal properties. Defective or incompatible resin can be the source of failure. And then there is just plain poor workmanship. How do you know if your boat or one you are thinking of purchasing has CD? Eventually, the signs are obvious—springy decks, the sound of cracking or squishing underfoot, even water squirting or oozing from cracks or under hardware. Less extensive delamination may be located by tapping the laminate with a brass or plastic mallet or the plastic handle of a screwdriver. Intact laminate sounds sharp, delamination or saturation sounds duller. The exact sound is not important; it is actually the change in sound you are listening for. A marine surveyor may arrive with a moisture meter, but such meters are scandalously unreliable for determining core condition, no matter how confident the user. The unerring test for core wetness is exploration. For a prospective boat, you may have to be satisfied withdrawing some hardware fasteners and probing their holes. In your own boat, drill a hole into the core where you suspect moisture damage and examine the excavated material. If you are still not sure, an underused tactic is to monitor a square of clear plastic placed over the hole, sealed completely on all four sides and exposed to the sun. Seal a second piece adjacent, not over a hole, as a control. If moisture forms on the underside of the test square, it is coming from the core. A core sample taken with a hole saw can eliminate all doubt. Considering there is no pill for CD, how should you proceed? Core issues in a hull should never go untreated but for a springy deck, living with it is one choice, sometimes the best one for older boats where the skin is sufficiently strong. Stiffness might be restored by adding stringers or other external reinforcement. Where delaminated core is dry, restoring the bond by resin injection is an occasional possibility. Perforating the top skin can allow uncompromised wet core to dry naturally (shielded from weather) or the process can be hastened with dehumidification, heat or vacuum. Filling a pattern of drilled holes with reinforced resin that bonds to both skins can restiffen a deck by providing a columnar substitute for the decayed core. However, when the core material is damaged, the best solution and often the easiest in the final analysis, is to remove one skin, replace bad core, then rebond the skin or laminate a new one. Done properly, this restores the structure to full integrity. Barring manufacturer defect, CD is easily prevented by avoiding impact damage and keeping moisture out of the core. The ubiquitous boat term “rebedding” should clue you in that sealants are inadequate for the latter. Sealants inevitably fail, letting water into the core long before you see a trickle in the cabin. Every hole into or through composite laminate needs to be drilled oversize, filled with reinforced epoxy, then drilled again to seal the opening away from the core material. Larger cutouts in the skin must have the core around the hole excavated and replaced with reinforced resin. In the end, virtually all soft decks are due to neglect. Being forewarned is being forearmed. If you maintain the seal that protects the core, your boat is unlikely to ever suffer from CD. If you don’t, major repair and/or significant expense or loss is surely in your future. Be vigilant.